In February of 1845 the British admiralty elected the former governor of Tasmania, the British explorer Sir John Franklin which had leaded two previously expedition in the Arctic (1819-1822 and 1825-1827), to the leader of one of the most ambitious projects of the time: to find the legendary northwest passage. For centuries sailors searched a way trough the ice of the Arctic, and finally it seemed that technology, ships with steam engines and a bow enforced with steel, could realize that dream. On May 19. 1845 the two expedition’s ships, the "Terror" and "Erebus", left Britain, two years later the expedition was declared lost. Between 1847 and 1850 different search and rescue missions were organized, but they found only some graves and pieces of the equipment, all 130 men of the expedition crew died. Canadian archaeologists have announced now that they found one of the ships used in one of these rescue missions, that got lost itself during the search: the "HMS Investigator". Fig.1. The HMS Investigator, Baring Island, 1851 in a contemporary painting, figure from Wikipedia. 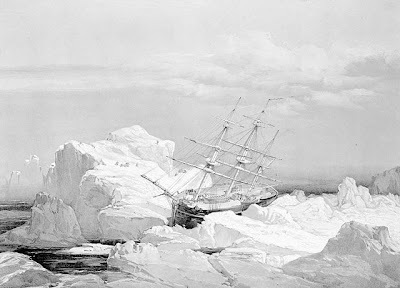 In 1850 the ship under the command of Captain Robert McLure got entrapped in the pack ice. The crew had to wait for three years for help; the Investigator was left back in the Mercy Bay and sunk later. The cold water preserved almost the complete ship, only the masts of the upright standing ship were destroyed by the drifting ice. was there ever a movie or tv drama made of mclures expidiction??? I´m not sure if it was the McLure - there were more "drammatic" (and unfortunately movie makers like such stories more) expedition like under the command of Shackleton or Franklin ( I will try in future to wrote something about it). "The Coldest March: Scott's Fatal Antarctic Expedition."